"Corpse Bride, often referred to as Tim Burton's Corpse Bride, is a 2005 British-American stop-motion-animated musical fantasy film directed by Mike Johnson and Tim Burton with a screenplay by John August, Pamela Pettler, and Caroline Thompson based on characters created by Burton and Carlos Grangel. The plot is set in a fictional Victorian era village in Europe. Johnny Depp led a cast as the voice of Victor, while Helena Bonham Carter voiced Emily, the title character. Corpse Bride is the third stop-motion feature film produced by Burton and the first directed by him (the previous two films, The Nightmare Before Christmas and James and the Giant Peach, were directed by Henry Selick). This is also the first stop-motion feature from Burton that was distributed by Warner Bros. Pictures. It was dedicated to executive producer Joe Ranft, who died during production. "The film was nominated for the 78th Academy Awards for Best Animated Feature, but lost to Wallace & Gromit: The Curse of the Were-Rabbit, which also starred Bonham Carter. It was shot with Canon EOS-1D Mark II digital SLRs, rather than the 35mm film cameras used for Burton's previous stop-motion film The Nightmare Before Christmas." Wikipedia has good sections on the production of Corpse Bride. Tim Burton on His Relationship with Johnny Depp: "It was weird because we were doing both at the same time. He was Willy Wonka by day and Victor by night so it might have been a little schizophrenic for him. But he’s great. It’s the first animated movie he’s done and he’s always into a challenge. We just treat it like fun and a creative process. Again, that’s the joy of working with him. He’s kind of up for anything. "He just always adds something to it. The amazing thing is all the actors never worked [together]. They were never in a room together, so they were all doing their voices, except for Albert [Finney] and Joanna [Lumley] did a few scenes together, everybody else was separate. They were all kind of working in a vacuum, which was interesting. That’s the thing that I felt ended up so beautifully, that their performances really meshed together. So he was very canny, as they all were, about trying to find the right tone and making it work while not being in the same room with each other." 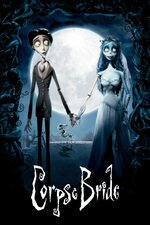 Roger Ebert: "'Tim Burton's Corpse Bride' is not the macabre horror story the title suggests, but a sweet and visually lovely tale of love lost. In an era when most animated films look relentlessly bright and colorful, 'Corpse Bride' creates two palettes, and not the ones we expect." I wanted to like this so much more than I did. As a Nightmare Before Christmas fanatic, a new stop-motion Tim Burton movie with a script by Caroline Thompson and a Danny Elfman score was a very, very exciting proposition. But the result is just kind of... OK? The film looks great (even if it doesn't dazzle like Nightmare) but the story and characters just don't have much oomph. The lead character is nice but pretty passive, and so is the Corpse Bride AND his living fiancee. I vaguely remember some upper class villain... but jeez, I couldn't tell you what his story was. I remember his final scene, where he gets dragged off to corpse land, but I have no memory of what he was up to before that. That's not good. I remember thinking that Elfman's music was similarly bland, and bland is usually not the word for that guy. (If anything, he has a rep for being big and bombastic.) The film had some great design and animation, but everything else about it was pretty blah. I wanted to like this so much more than I did. Oh yeah. Visually it was nice but . . . I was kinda bored. The final scene baffled me - isn't he dead? What are they supposed to do to him, kill him? - and the story was kinda . . . meh. Man, poor Corpse Bride. Just me saying it was pretty blah and another poster agreeing it was pretty blah, and that's that.